To view some photographs from our first two County Senior Football Championship games v Rathgormack and St. Saviours, click on the County Senior Football Championship 2012 link on the Photos page of the website. Many thanks to Seán Byrne for providing us with the pictures. This is the league table after the second round of games in Ballinacourty’s County Senior Football Championship Group. Back Row (L to R): L. Enright, P. Hogan, E. Moore, D. O'Connor, M. Kiely, B. O'Connor, J. Cosgrave, M. Hogan, B. Shields, P. Norris, T. Mansfield, P. Wall, D. Whelan. Front Row (L to R): P. Daly (Selector), D. Barry, D. Murray, J. Elsted, P. Enright, J. McGrath (Capt. ), P. McGovern, J. Hogan, V. Byrne, J. Flynn. This week's photo shows the Ballinacourty football team that won the County Intermediate Title in 1965. Early rounds produced victories over Cappoquin and Affane before a decisive 2-8 to 0-2 Western Final win against Clashmore. The County Final, played at Fraher Field in November, saw another decisive victory, this time over Rathgormack on a scoreline of 3-9 to 1-0. 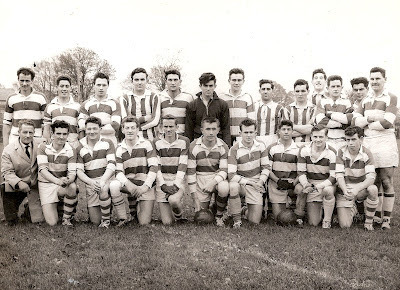 Thus, Ballinacourty entered the senior ranks for the first time in the club's 18 year history. Teamer.net, the service we use to contact players about team events is now only allowing each team to have 200 free texts per month. It is vital when you receive a teamer that you respond straight away so as it does not cost your manager money. Also if you have given your email address the teamer notification will automatically go to your email because it is still free so please check your emails as well. We ask all our members for their cooperation in this so as to keep our running costs down. We played Lismore in the Western Feile hurling final last Monday in Cappoquin. A very strong Lismore side started very well and had a good lead at half time. Our lads battled well in the second half but Lismore were convincing winners and go on to represent the west in the county Feile final. Panel: Aaron Beresford, Jack Kiely, Shane Ahearne, James Beresford, Padraig Moore, Bearach Moore, Gearoid Hallinan, Tom Looby, Neil Montgomery, Patrick Power, Ryan Daly, Darragh McGrath, Tony Collins, Sean Whelan Barrett, Sean Crotty, David Montgomery, Michael Riordan, Tommy Walsh, Seamus Ryan, Mark Twomey. Next matches in this age group is Under 14 football at home in both divisions to Dungarvan and Stradbally. This week it was the turn of the U 11’s in their hurling league. We travelled to Tallow to play Cois Brid. This was a very good competitive game of hurling with a high standard through out. Our lads were always just holding slight advantage to win by 5pts 1-6 to 3-5. Our second team travelled to Ballinameela to play St. Olivers. This was a very low scoring game and we lost out 2-0 to 0-2. Next matches in the age group is away to both Dungarvan and St. Pats on Friday 4th May. This week our two U12 teams play Cois Brid and Ardmore on Friday evening in Abbeyside. Our under 16 boys had a very busy week on Monday night. They played Dungarvan in the Dungarvan club grounds. The weather on the night was atrocious. The boys never got into this game and Dungarvan came out on top. On Saturday morning the boys made the trip down to Gaultier. This was a vital game for the boys as they badly needed a win, the weather once again on this occasion was not the best with the lads playing into a strong wind in the first half but to be fair to the boys they worked hard and came out on top at the final whistle. Next Saturday morning the lads play at home to Roanmore with an 11.30 throw in. Our under 8's went on tour on Saturday last to Dublin, leaving the club grounds at 8.30a.m to arrive in the big smoke at 11.30 for a tour of Croke Park. After the tour we enjoyed a packed lunch overlooking the stadium in the kids’ cafe above the Davin Stand. Back onto the bus heading for St. Jude’s of Templeogue, where we played both hurling and football; making up two nine aside teams with great team performances on show from both clubs. Thanks to St. Jude’s for their hospitality in serving up teas, coffees, sandwiches, crisps and drinks for their Waterford visitors and expressed much interested in a return match sometime in the future. A huge thanks to our travelling parents, without their support this event would not have been possible. Thanks also to Flynn’s buses and to Tom our driver for the day. Thanks again to all involved and well done to our under 8 squad who did their club proud both on and off the pitch. We played the under 11 town & country hurling league against St. Olivers on Thursday night, this was a very close game and some good hurling. We travelled to Castlemartyr on Saturday morning for a football tournament, we played three games in this tournament with our lads playing some good football in all the games especially their last game where they showed great spirit. Our goalie, Eoin Flynn made several brilliant saves on the day and we better be careful that his dad’s premier league club don't send a scout. Our back line of Ben O’Donovan, Jack Riordan, Sean O’Sullivan and Daniel Treen played very well. Our midfield trio DJ Kiely, Colin Foley and Alec Norris delivered some great ball and worked very hard and our forwards took some great scores with the dominant Niall Buckley, Jamie Moylan, Darragh Slevin, Tadgh Collins and of course Tony Dwyer who was outstanding. We would like to thank the organisers for an enjoyable tournament. We are out this Saturday in the Carriganore football tournament where the throw in is at 11am. On Friday evening last we had a very successful Registration evening. We would like to welcome all our new girls to the club and hope you all enjoy both training and playing with the Club. New members are always welcome, just come out to pitch any Friday evening at 6.30 or all contact details are available on the Abbeyside/Ballinacourty GAA Club website under the camogie section. Training continues for all age groups every Friday evening from 6.30 to 7.30. U12's will continue to train both Tuesday and Friday evenings from 6.30 to 7.30. On Saturday morning last our U12 team took part in their first blitz of the year in Cappoquin. On the morning we played games against Ballyduff Upper, Brickey Rangers and Cappoquin. A great morning was had by all. The girls gained great experience from these games and confidence grew and grew with each game played. Girls involved were Amy Kennedy, Catherine Ruane, Katelyn O'Brien Landy, Ellen Regan, Katie Wright, Sarah Wright, Saoirse McDonnell-Moynihan, Abby Daly, Becky Lawrence, Kellie Mulhearne, Katelyn Fahey, Ciara Keane, Mairead Maye, Sasha Landy, Sinead Kirwan, Laura Cosgrave and Hannah Walshe. Joker tickets available to buy at any training session from Claire or Carmel. Work being done from proceeds of sales from these tickets is clear to see in dressing rooms and grounds. This is the league table after the first round of games in Ballinacourty’s County Senior Football Championship Group. Back Row (L to R): Pádraig Quinn, Kelvin Brady, John Kindregan, Joey Mullen (Capt. ), DJ Carey, Anthony Whelan, David Hickey. Front Row (L to R): Alan Tobin, David Drohan, Kevin Ryan, Billy Ryan, Richie Foley, Alan Flavin. 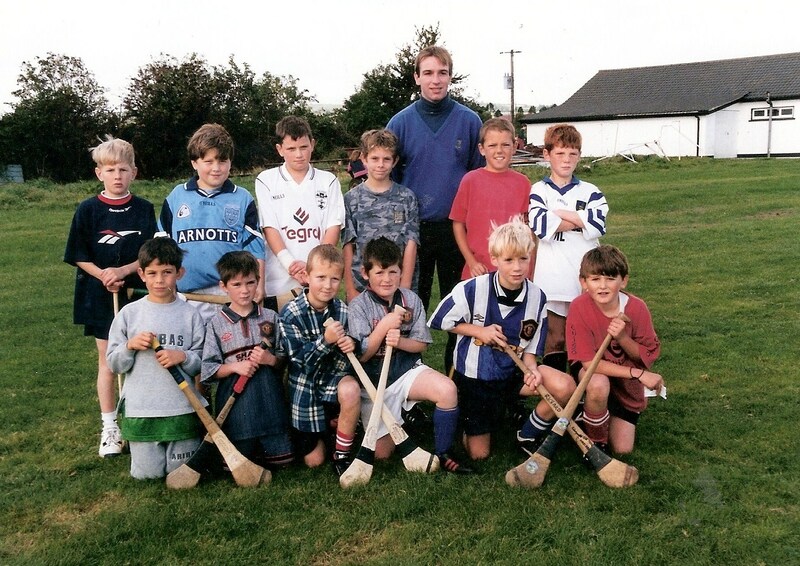 This week's photo shows Kilkenny hurling legend, DJ Carey, on a visit to the Abbeyside Club Grounds in 1996. Here he is pictured with the runners-up of the O'Shea Cup, an internal underage hurling competition. Our popular Jack the Joker Fundraiser will continue this Sunday night in The Stables Bar where the Jackpot will be €6,044. This week Marie Maloney was drawn out of the drum but did not find the joker but did win €50 euro while Kevin and Nora Tobin and Switchie O’Donnell won €25. We appeal to all our supporters to continue purchasing the tickets as the funds raised will go towards our ongoing development works at the club grounds. On Monday evening last our Minor Footballers played their second game in the County Championship when they welcomed Dungarvan to our club grounds and we would like to thank the Dungarvan club for their co operation in re-fixing this game. The game was a typical local derby played in a good sporting spirit and with time up we led by four points but no less than seven minutes of extra time were played at the end of which the sides were level at 1:06 each. This Monday we are away to Gaultier with a 7pm throw in. Our Senior Hurlers played two games last week. On Monday we welcomed Dunhill to our club grounds for the first round of the Sargent Cup and recorded a very good victory to move onto the Second Round of the Competition. On Thursday evening we were again at home to Fourmilewater in the County League. At the end of a good game of hurling our opponents were victorious on a score of 3:13 to 1:16. On Sunday morning last we recorded our second victory in the County League as we defeated Ardmore on a score of 3:04 to 1:07 in our own club grounds. This Saturday night we open our Championship campaign when we take on Rathgormack in Fraher Field at 7:30 pm . This Sunday we take on The Nire in Colligan at 2pm in the first round of the Championship. Our Junior Football team are the first team into Championship action this weekend when they take on Old Parish in Bushy Park at 7:30 pm. Anybody who wishes to order a copy of the Under 21 County Final which costs €10 can do so by contacting Neil Moore or Eddie O’Halloran by Friday next. Our club bingo will continue in the CBS Hall this Sunday night where the Jackpot is €450. There will be a meeting of the Club Committee this Thursday night at 8pm in The Parish Office. Our club website has undergone a major renovation recently and is well worth a visit to catch up on all the upcoming fixtures and recent results as well as containing some photos from previous years. Log onto www.abbeycourtygaa.com to see for yourself.